You have been trying to figure out how to get over infidelity pain and just can’t find relief. The feelings of betrayal and disgust are overwhelming. The mere idea that you are in pain and can’t make it stop adds to your rage. You carry the fear that it’s was all for nothing, and that you are helpless to create a change. This pain is real. It hurts like hell. And I know you want an answer. You want more than a how to get over your infidelity pain; you want justice. Something that will make it worth it. You wish for absolution for your suffering. You want to know you’re not alone. That you don’t have to carry this weight on your own. You want help deciding the right answer. You are fearful of your confusion. There are times, moments when you can briefly escape the pain. Perhaps distractions or flashes of hope. But in the end, it all crashes back down. And, sometimes the pain seems to come out of nowhere, faster than you can blink. Sometimes it keeps hurting because you can’t seem to accept the unacceptable. So instead, you struggle, avoid or try to escape. But what if this is causing it to hurt even worse? What if it’s the resistance, the fear of the unknown, the belief that you “can’t” that’s keeping you writhing in pain? The agony is often deeply tied to the fight against the pain, rather than the pain itself. To you who have been abandoned, cheated on, lied to or rejected by those you love most; your salvation is surrender and acceptance. For you who have been left high and dry, lost, and unsure of where to turn, you can find your answer in letting go. To those who are anxious and feel trapped by an absence of choice, your clarity will come when you relinquish the fight and open to new possibilities. I know each of you. Your story may be different. But I understand your pain. It is in the acceptance that I have found relief and progress. When I have fought, no, raged against the thing which wronged me; I became trapped in my mind without a map. When I have become overcome with physical pain and felt a terror that seemed only death could relieve, I chose to let go of the need for answers or solutions and relied on faith and trust it would pass in time. Anger, hatred, resentment, helplessness, exhaustion, and despair come from holding too tight to what was. Begin to consider that in releasing the past, you can open to the future. You don’t need always to know how or why. Those answers aren’t always available when we want them. Consider the possibility that what is happening is ok and what will come is ok too. In therapy, we sometimes revisit the past to remove blocks to healing. There is no need to linger there. We get in and out, with the purpose of sourcing healing. History is a part of your process. 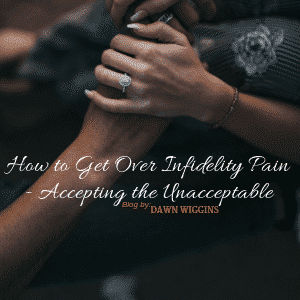 No matter how crazy it sounds, how to get over infidelity pain requires accepting life for what it is today. This can bring immediate relief. Everything changes. Regardless of how tight you hold. A brighter life is waiting for you if you can stop insisting on your way. There is another way for you to learn. A lighter, more comfortable and more peaceful way. Take a rest, get some perspective and do something different. Some struggles last longer than others. Living becomes harder when we believe it’s not fair or that we aren’t supposed to struggle. You are beautiful and perfect even in your struggle. Others may not agree. You may be wondering HOW to do this. How can you accept something so painful? You can begin with awareness. Awareness that your way of dealing with pain may not be working so well. You may also consider that others have found a path to relief. If it’s possible for them, why not for you? Gather up your insight and your hope and take a leap towards something different. If you want help with the next step to learn how to get over infidelity pain, reach out to me! I’d be honored to support you on this journey.